We will continue to update this section. Please check back often. Flights will be purchased in March/April. As soon as we have the flight itinerary, we will post it here and email it to you. American Airlines changed their baggage policy at the begging of 2018. Please pack according to the information below and that on the American Airlines website. Each participant is responsible to pay for their own bags. Carry-On: You can bring one personal item that fits under your seat (18 x 14 x 8 inches). A backpack is ideal. As well as one carry-on bag that shouldn’t exceed 22 x 14 x 9 inches / 56 x 36 x 23 centimeters (including handles and wheels). Must fit in the sizer at the airport. Checked Luggage: A 50-60 liter duffel bag or backpack is ideal. If you purchased a service trip kit, you should be able to fit everything within that duffle bag. We recommend bringing old clothes or clothes you wouldn't mind getting dirty or ruined. Everything on this list are items you most likely already have. 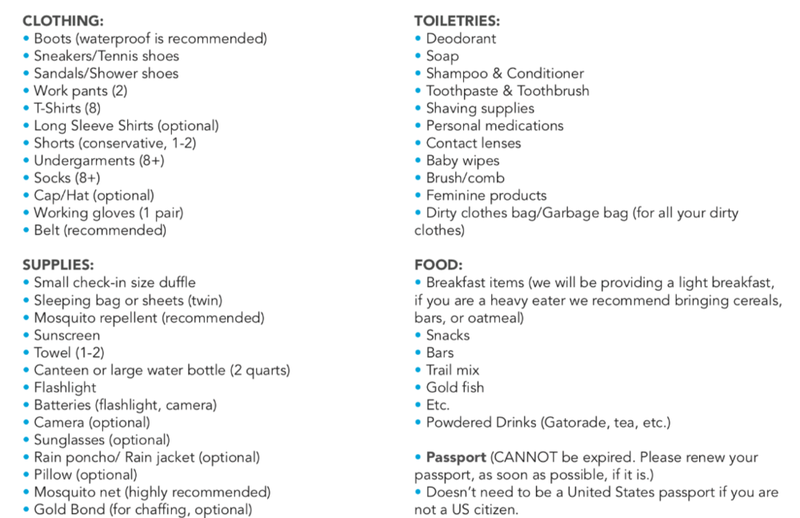 Feel free to share items on the supply, toiletry and food list with friends who will be joining you on the trip.